The double breasted (DB) suit is back with a bang and is slowly becoming the go to attire for classy gentlemen everywhere who are not afraid of the limelight. The double breasted suit, jacket and or blazer does not need any special occasion. You can wear it anywhere you would have worn a single breasted suit. In fact it will be a nice change, you will stand out. Since the DB Look is in vogue this season, we bring to you seven different styles you can flaunt with a Double breasted blazer or jacket or suit to make most of it. There is an old saying that goes dress for the job you want not the job you have. When climbing the corporate ladder your appearance creates as much lasting an impression as much as your work does. A DB in pinstripes or grey, charcoal hues will make you stand out from the rest of your competition. Pick a simple and elegant 6 on 2 DB and team it up with a button down oxford shirt. You can add a tie and a tie pin to this look and complete it with some formal shoes. For this look pick a DB in subtle hues like cream, grey or navy. Loose the tie; you can maybe add a cravat. Combine your DB with a turtleneck sweater or a button down shirt. Loose the tie. If you want to add some character, add a nice lapel pin to the ensemble. Pick a split DB and pair it with chinos or shorts. You can either wear a shirt or a t-shirt depending upon your personal style. Pick complimentary hues and finish off with derbies or loafers. In order to dress down, wear denims with a white button down shirt and a DB Blazer. Monk Straps will work wonders for this look and add that extra zing. This look is for when the sea beckons. 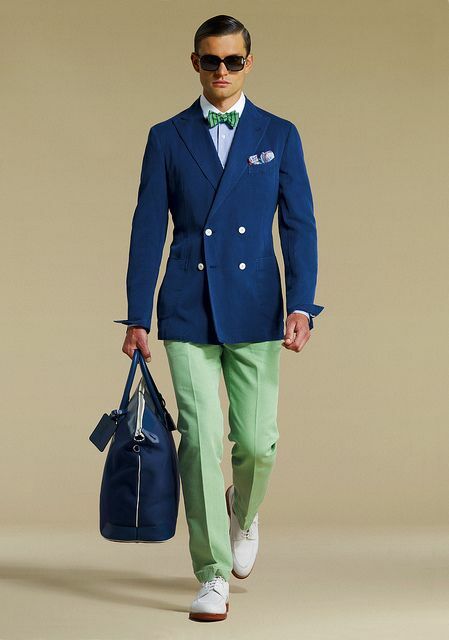 Pair a DB blazer in nautical hues of blue and red with some white trousers and suede loafers. You can even add a hat. Look chic and hot when the weathers nippy by combing you DB suit with a roll neck sweater. Pick a 4 on 2 DB jacket in soft woollen fabric and the sweater in cashmere, wool or a nice blended fabric.